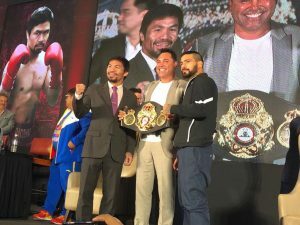 On Saturday Manny Pacquiao will be co-promoting his next fight with Golden Boy Promotions at Kuala Lumpur, Malyasia and will be fighting in the United States on ESPN+. Pacquiao’s long time promoter, Top Rank, is involved with the distribution of the fight in the United States but is not assuming their normal promoting duties for Pacquiao. Not only is Pacquiao not using the full services of Top Rank Promotions, but he’s also entering this fight without the assistance of his long time hall of fame trainer, Freddie Roach. Pacquiao has already stated that this will not be his last fight, but a loss here could seriously hamper his drawing power as a money fighter. He’s also facing a strong puncher with knockout power in the welterweight division. Three other title fights are also on this card. Carlos Canizales will be defending his WBA “Regular” Junior Flyweight Title against Bin Lu. Moruti Mthalane and Muhammad Waseem will be fighting for the vacant IBF Flyweight Title. Also, Jhack Tepora will be facing Edivaldo Ortega for the vacant WBA Interim Featherweight Title. The following is a preview of the main fight of the night between Lucas Matthysse and Manny Pacquiao for the WBA “Regular” Welterweight title. Manny Pacquiao has been featured on 23 PPV fights and for a long time was one of boxing’s most popular draws. However, he’s thirty nine years old and turns forty in December and this will be his second consecutive fight not on PPV. His drawing power in the United States is waning, and he’s taking on a risky fight after his controversial, and outright terrible, decision loss to Jeff Horn. Pacquiao is four years older than Matthysse and will be giving up an inch in height and two inches in reach. Pacquiao has 38 knockouts in his resume and Matthysse has 36, but Pacquiao hasn’t had a stoppage victory since he defeated Miguel Cotto in 2009. Pacquiao only fought one time in 2017 and twice in 2016, but Matthysse has only fought once in 2018 and once in 2017. Both boxers haven’t been very active recently. Matthysse power can be devastating. He has defeated the likes of Tewa Kiram, Emmanuel Taylor, Ruslan Providnikov, Roberto Ortiz, John Monlina Jr., Lamont Peterson, Mike Dallas Jr., and DeMarcus Corley. He has disputable losses to Zab Judah and Devon Alexander and clearer losses to Danny Garcia and Viktor Postol. Pacquiao doesn’t fight with the same blind rage that he used to when he was younger, but he still possess good speed and movement. He has four losses in his past nine fights. Some of his more notable losses were to Floyd Mayweather Jr., Juan Manuel Marquez, Timothy Bradley Jr., and Erik Morales. His wins include Jessie Vargas, Timothy Bradley Jr., Chris Algieri, Brandon Rios, Juan Manuel Marquez, Shane Mosley, Antonio Margarito, Joshua Clottey, Miguel Cotto, Ricky Hatton, Osca De La Hoya, Maco Antonio Barrera, and Erik Morales. Father time is catching up with Pacquiao and he’s not taking on an easy opponent in a non-ppv fight. Luckily for Pacquiao Matthysse isn’t as big of a welterweight as Jeff Horn, but he still packs a lot of power in his punch. Can Pacquiao still hang with the best in the welterweight division? A lot of boxing pundits are saying no. His fight with Matthysse should give us a more definitive answer to that question.